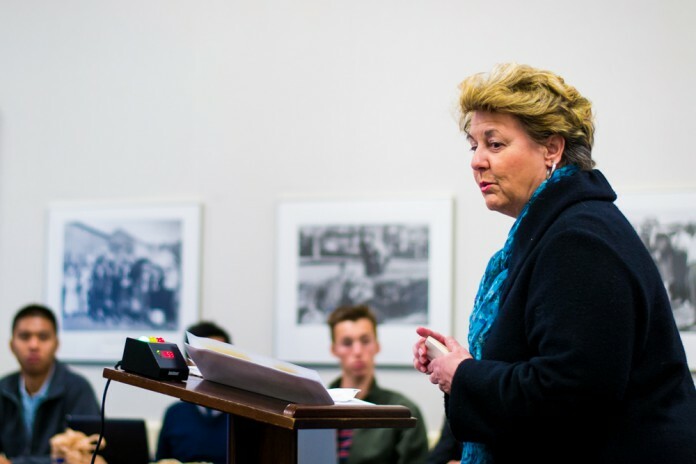 Associated Students Senate received a visit from Third District County Supervisor Doreen Farr and tabled “A Bill to Raise the ASUCSB Short-Term Emergency Loan Cap” for a week at its meeting on Wednesday, Feb. 5. Farr discussed a number of projects currently in progress for the improvement of the Isla Vista community. One of these projects, a master plan for Isla Vista street lighting improvements, was developed as a result of student efforts to map out locations throughout Isla Vista that lack sufficient street lighting. So far, the plan has brought about the implementation of better lighting on Del Playa and other streets that have demonstrated higher instances of crime. Another project Farr considers to be of vital importance is the opening of an Isla Vista community center at 970 Embarcadero del Mar, in place of the Isla Vista Clinic and the vacant church property currently located there. She said that the county has been fighting to keep the properties even after the dissolution of the County Redevelopment Agency, which previously owned both, and now is just waiting for the “final okay” from the Santa Barbara Department of Finance in order to begin development. Isla Vista is presently the only town in the county lacking such a center. Farr also discussed progress on Pescadero Lofts, an affordable housing complex that will replace what was once a fraternity house at 761 Camino Pescadero, with the goal of providing Isla Vista’s houseless population with more opportunities for shelter and assistance. The County Housing Authority is the complex’s nonprofit builder, and has committed to constructing the facility as a single-room occupancy project that will consist of numerous affordable studio apartments. The Lofts will also include various services to support the houseless and help them gain stability. Later that evening, Collegiate Sen. Ali Guthy and Off-Campus Sen. Jimmy Villarreal presented a bill they had composed in response to financial inconsistencies discovered during the annual AS audit some weeks prior. Though the yearly cap on total short-term emergency loans the association may allocate to students is currently set at $500,000, AS allocated over $600,000 to such loans both in the 2011-12 and 2012-13 fiscal years. In order to make this loan policy consistent with actual AS allocations, the bill stipulates an increased limit of $800,000. The cap on the actual per-student quarterly loan amount will remain at $600, as outlined by the current policy. The Senate will reconvene on its decision about the bill at its Feb. 12 meeting. Additionally, On-Campus Sen. Andrew Neiman, who authored “A Bill to Create a Standing Policy to Regulate Expenditures on Food at Meetings,” motioned to suspend the restrictions of the bill until the last Senate meeting of the quarter so as not to cause obstacles, such as those brought to the Senate’s attention the previous week, for BCCs with preplanned food budgets. The motion passed unanimously. Amid these other discussions and decisions, a significant bureaucratic adjustment was made with the swearing in of third-year English major Ansel McEuen Lundberg as Collegiate Senator of Letters and Science, a position from which third-year political science major Marvin Ramirez recently resigned.